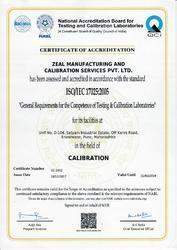 Zeal Manufacturing and Calibration Services Pvt. Ltd. has acquired the recognition of ISO 9001:2015 Certified Company. Zeal is engaged in manufacturing, exporting of Electronic Test and Measuring Instruments The complete range of products we offer includes Calibrators, Power Sources, Testers and Panel Meters. 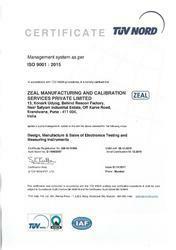 It was a glad movement for Zeal Manufacturing and Calibration Services Pvt. Ltd. when ISO Certifying Body declared the company services as confirming to international standards and awarded the ISO 9001:2015 certificate. We are amongst the few companies who have achieved the certification in a very short span of time. ISO 9001:2015 is one of the series of Quality Management System Standards that can help to bring out the best in any organization. It enables the company to understand processes for delivering the best Products/Services to customers that are on the mark with International Standards.